No prizes for guessing who was amongst the first people we asked to join us in the market. When we moved down to Southwark, I spent several fruitless days wandering around the area looking for something cheap, tasty, filling and which would hit the spot as far as my spicy chilli, noodle and rice cravings were concerned. You can take the gal out of Malaysia but you can’t take Malaysia out of the gal. Honestly… I wrote to my favourite eateries telling them about the lack of non-chain, hot food, Asian eateries in the area and sent them my research on foot fall, the type of competiton in the neighbourhood, the type of customers there would be (local offices and tourists from the Tate Modern, Globe Theatre etc), available A3 retail units nearby – that’s how desperate I was. Oooo… eyes open wide, I crossed the road oblivious of the traffic and sniffed the air tentatively. It was 9am, so not much was happening. I peered in expectantly as the little person in my head filed the place away for further inspection. 12:00 sharp I was out of the office and down the road… lovely curry spicy smells drifted on the breeze as I got nearer. There was a queue outside… good sign. 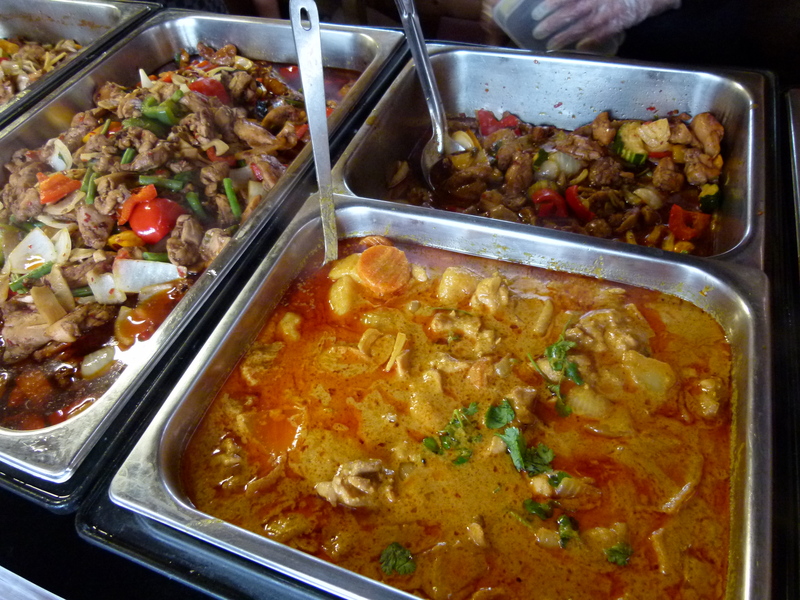 As I went walked up I could see there were two stalls – one with pre-cooked steaming hot curries and stir fries, yellow chicken curry, tom kha gai, chicken with basil and cashew nuts, vegetarian green curry, salmon red curry. Mmmmm……… The formula is simple – you can have steamed or fried rice, or fried noodles, paired with any of the hot dishes. 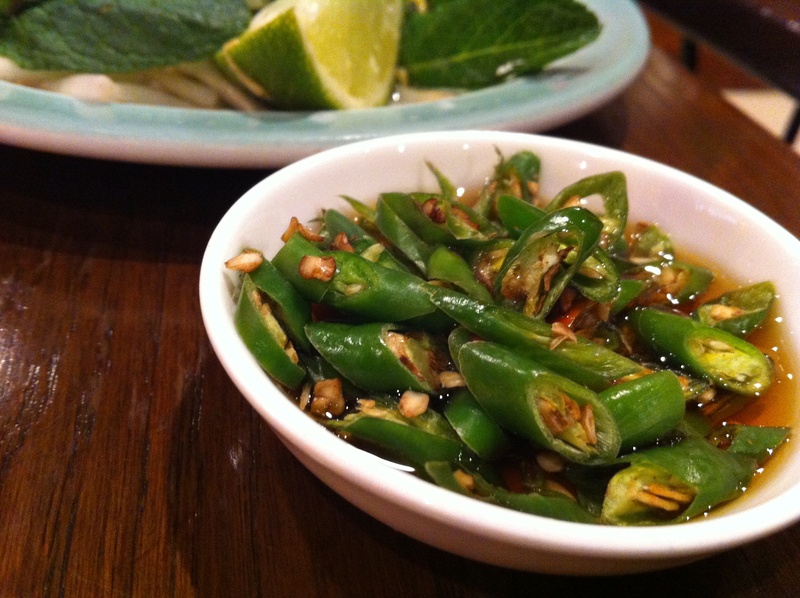 …chilli oil with dregs, sweet chilli sauce, crushed peanuts and lemon slices – so you can tailor your meal to your satisfaction. 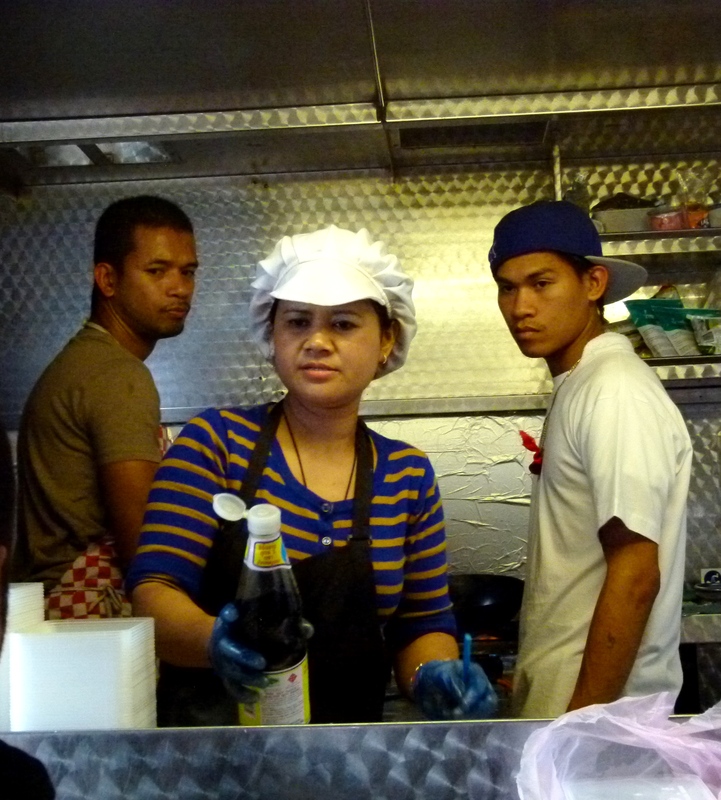 On the other stall, they cook fried noodles or rice to order from a menu of Thai favourites. These are cooked to perfection – really well seasoned, noodles have just the right amount of bite (not too sloppy), and fried rice with a spicy kick. They use heaps of fresh vegetables, spices and herbs and it all tastes good, good, good. Nothing too fancy – just honest, tasty, cheap food like you would find in South East Asia, where workers, families, young and old can sit down for a great meal. As an added touch of loveliness, they give away free prawn crackers on Fridays but you have to get there early before they run out. What more could you want? I’m thrilled to be partnering with Bangkok Kitchen on this, our first South East Asian street food market. Farhen and Guitar, business partners of BK, have been so incredibly helpful – we’ve got off to a brilliant start. So, who next? Well, my long time friend and occasional business partner, Hi Ching, heads up an arts company, River Cultures and got in touch to tell me about a new arts festival he was putting together, looking specifically at South East Asian arts and culture. What could I do to help? Hi and I had worked together a few times before. First he cast me in a mad show that he had written and produced at the Albany Theatre, then we partnered up on various Chinese New Year Festivals at Canary Wharf, in the City and the Southbank, and setting up and running an organic teahouse in Oriental City. Well – what about something to do with food, I said. Food is, of course, integral to any culture and SE Asian life pretty much revolves around where to get the next excellent meal. Hi knows I’ve always wanted to develop a food court or street food project, knows I’m mad on food, a bit OCD when it comes to organisation and project management – and thus the Five Foot Way street market was born. So, the next step was to find a place to hold it. I was really keen to hold the market near my office as I had grown to know many of the businesses in the area, and spent my lunch hours walking around and exploring – mainly to find delicious lunch options. By coincidence, Hi had organised several events for the arts festival in the area, and there was a natural synchronicity in the way things were beginning to pan out. I trawled the internet for venues in the area, pounded the pavements after work and during lunch looking for places that looked like they might be suitable and contacted the very helpful Hire Space in my quest for the perfect venue. Now, Southwark is up and coming, and there were a lot of possibilities but it doesn’t yet have the trendy appeal of Bermondsey or Shoreditch, so it wasn’t looking great. Had a quick Google and found their Facebook page and got in touch. Well, we arranged a meeting and met up with the gregarious and energetiic Farhan, and his talented business partner, Guitar, and the pieces just fell into place. But not in the way I imagined. It soon became clear that great though the space at Star Anise is, the courtyard which houses Bangkok Kitchen would be much better. It’s semi-open-air and semi-covered, so we’ll get the feel of an outdoors bustling market, and still be prepared for possible inclement October weather (although I’ve put in my order for brilliant weather early). I love the atmosphere at Bangkok Kitchen, it’s semi-secluded and when it’s busy there’s the pleasant hum of people just enjoying their food in a relaxed environment. It feels as close to a South East Asian street stall as I could wish. This blog post from She Simmers sums up how great it is there. So there we have it, the first leg of this journey is done. Next, how to find the food? 5 Foot Way’s first South East Asian street food market is confirmed and in the diary for 5 October 2013. It’s taken many years of dreaming and finally I’ve taken the plunge and found a venue. I’m very excited to have found a lovely space off Union Street in Southwark. I’ve lived in Southwark for nearly 20 years, and my office moved to this area last year. Since then, I’ve been making friends in local businesses and exploring the area. Ever since I started working in Southwark, I’ve loved finding out more about this patch of London which is seeing fast growth and development – not just the usual chain stores and large building projects, but small quirky businesses and community projects that give the area a great neighbourhood feeling. As a massive food enthusiast, I’ve been keen to do my utmost to find independent, high quality food outlets; and also tried to find places where street food vendors could set up shop. In the last few months, I’ve been excited to find Bangkok Kitchen, a gem of a Thai street food stall on Union Street, who are our partners in hosting this unique project. The timing seems right – the market will run in conjunction with London’s first South East Asian arts festival – SEA Fest, and together we will be showcasing the very best of the region’s arts practitioners and culture in the UK. Over the next month, I’ll be posting up details of the talented and passionate street food vendors we have lined up for 5 October and am excited to partner with them in showing the best of South East Asia.